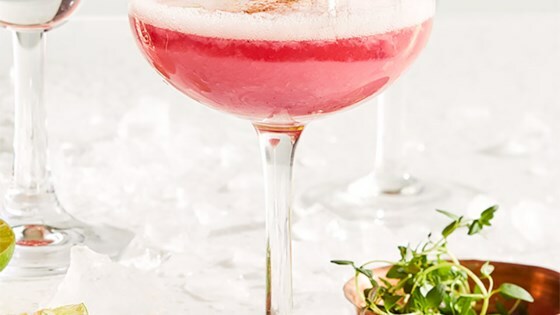 "The egg white foam on top of this pretty drink begins to break down after about 10 minutes, so be sure to take a photo of your Clover Club and drink it up before that happens." In a cocktail shaker, muddle raspberries and thyme. Add gin, egg white, simple syrup, and lemon juice. Shake until mixture no longer sounds sloshy and you feel a lot of pressure. Add ice to fill shaker half-full. Shake again until very cold. Strain into a coupe or cocktail glass. Dust top with cinnamon, or garnish with lemon zest curl or additional thyme. One ounce pasteurized liquid egg whites is a suitable substitute for the regular egg white. Easy Shaken Simple Syrup: Shake 1 cup sugar and 1 cup water in a Mason jar until dissolved. If your arm gets tired, just set it down and let the sugar continue to dissolve all by itself. Store, covered, in fridge, up to 3 weeks.